In Trustees of Boston University v Everlight Electronics Co., Ltd., [2016-2576, 2016-2577, 2016-2578, 2016-2579, 2016-2580, 2016-2581, 2016-2582, 2016-2591, 2016-2592, 2016-2593, 2016-2594, 2016-2595] (July 25, 2018), the Federal Circuit reversed the district court’s judgment that U.S. Patent No. 5,686,738 was not invalid, because the ‘738 patent was not enabled as a matter of law. The claim was directed to a semiconductor device comprising “a non-single crystalline buffer layer” and “a growth layer grown on the buffer layer.” “Grown on” was construed to mean “formed indirectly or directly above” meaning that the growth layer and the buffer layer do not have to be in direct contact; there can be intervening layers between them. “[A] non-single crystalline buffer layer” was construed to mean “a layer of material that is not monocrystalline, namely,  polycrystalline,  amorphous or  a mixture of polycrystalline and amorphous. As a result of these constructions, the claim covered six possible configurations. The enablement issue concerned one of these permutations — a monocrystalline growth layer formed directly on an amorphous buffer layer. The district court It concluded that the ’738 patent did not have to enable a device with a monocrystalline growth layer formed directly on an amorphous buffer layer, as long as it enabled a device with a monocrystalline growth layer formed indirectly on an amorphous buffer layer. The district court questioned whether this particular permutation was taught, but nonetheless found that a reasonable jury could have concluded that Defendants failed to show that claims were not enabled. A patent’s specification must contain a written description of the invention, and of the manner and process of making and using it, in such full, clear, concise, and exact terms as to enable any person skilled in the art to which it pertains to make and use the same. To be enabling, the specification of a patent must teach those skilled in the art how to make and use the full scope of the claimed invention without ‘undue experimentation. Defendants’ expert testified that it is impossible to epitaxially grow a monocrystalline film directly on an amorphous structure, and Boston University’s expert agreed. The Federal Circuit further noted that Boston University could not identify any portion of the specification teaching the particular permutation, and relied only on conclusory expert testimony. While there was testimony that the a crystalline layer could be grown on an amorphous layer, the Federal Circuit instructed that the inquiry is not whether it was, or is, possible to make the full scope of the claimed device. Instead, the inquiry is whether the patent’s specification taught one of skill in the art how to make such a device without undue experimentation as of the patent’s effective filing date. When viewed in this light, Boston University’s evidence was not probative of enablement. Simply observing that it could be done—years after the patent’s effective filing date—bears little on the enablement inquiry. scope of the claimed invention. This is not to say that the specification must expressly spell out every possible iteration of every claim. But any gapfilling is merely supplemental; it cannot substitute for a basic enabling disclosure. The Federal Circuit noted that Boston University created its own enablement problem — it sought a construction of “a non-single crystalline buffer layer” that included a purely amorphous layer. If it wanted to claim this, the Federal Circuit said, it should have taught it. The Federal Circuit reversed the district court. U.S. Patent No. 8,330,305 covers protecting devices from impact damage. 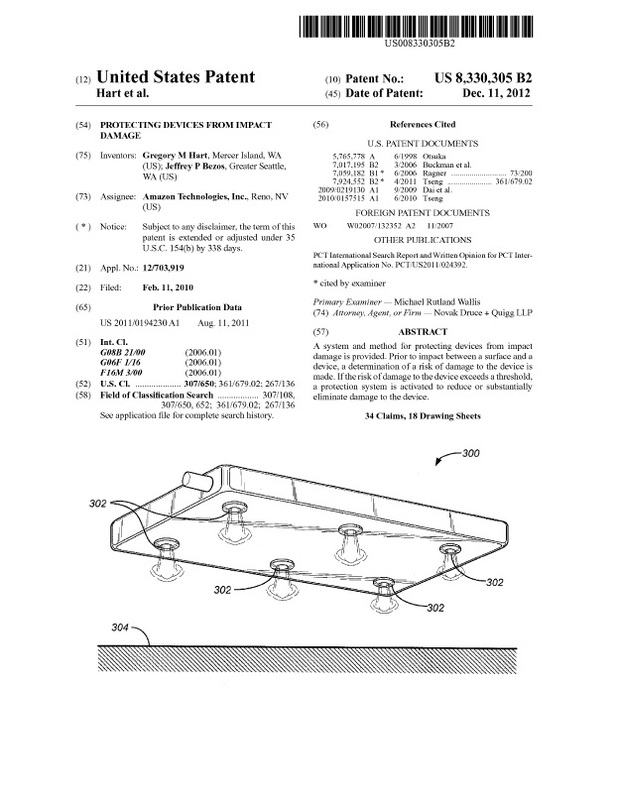 The patent claims detecting that the portable device will impact a surface, and, if the risk of damage to the portable device from the impact exceeds a damage threshold; altering the orientation of the portable device so that the air bag will impact the surface first, and deploying the airbag before the device impacts the surface. The embodiment shown appears to be a cell phone, and it is hard to imagine that a reasonably sized cell phone could contain both an airbag and a system that could reorient the cell phone in a ~42 inch drop from the hands of a user. In 7200 words and a dozen figures, the disclosure seems to barely meet the plausibility threshold, let alone enablement required under 35 USC 112(a).